Criterion will final say on the new Most Wanted onward. 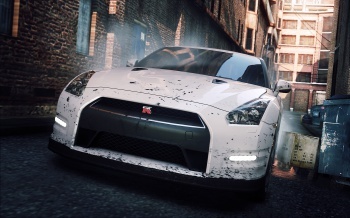 If you ever felt that the Need for Speed series could do with more slow-motion vehicular collisions, you'll be pleased to know that Criterion (creators of the Burnout series) now has full control over EA's popular driving franchise. Criterion vice president Alex Ward confirmed the news at E3. He explains that instead of having several studios responsible for different Need for Speed titles, Criterion will be involved in every Need for Speed and Burnout title from now on. "Different studios have had a crack at it - it's definitely a Criterion gig now," he says. It isn't clear if Criterion is going to be involved in the actual development process of every Need for Speed title in the pipeline, or if they're merely overseeing the direction the series. Ward did confirm, however, that the company will have the final say as to which Need for Speed titles will be released, saying, "Going forward now, with Most Wanted and what we'll do in the future [will have], shall we say, a strong Criterion involvement. I'm personally involved in how the cars drive, how the game will play out, how connected they are, and what the features are." He also suggested that EA's original plans to have yearly Need for Speed games may be vetoed: a move that will certainly prevent the series from becoming too watered down. The additional workload may be cause for concern among Burnout fans, but Ward wants to reassure them that Criterion is still thinking about the franchise constantly. There is no indication of a new game just yet, but suggests that it will take "something big" to achieve the goals they have in mind for the series.